Charming ocean block, midtown building with central air and private east facing covered porch providing a view of the ocean. Outside shower and one parking spot. 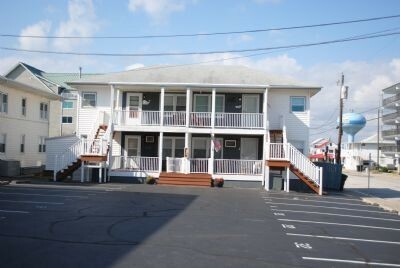 Walk to J/R’s or enjoy the other nearby restaurants, either bayside or boardwalk. Water sports or fishing and crabbing opportunities abound along with shopping or evening cruises either bayside or along the coast. Lazy Whale building has outside shower among other amenities.